Those Swiss Army knife people certainly know how to make knives. Very sharp knives. While using one of their kitchen knives earlier in the week, I carelessly took a small chunk out of my thumb. Be warned: slightly gory picture ahead. From time to time some of my blog posts are about personal stuff, rather than the wider world. This is one of those posts. Yesterday was a day of excisions. I had many thousands of hairs excised from my head at the barber. Easy. And I got the lump taken out of my leg. You may recall from my last post the quandary of paying for private vs getting it done in the public system. Multiple health professionals had said it would take ages to get through the public system elective surgery queue. They were wrong. In fact within a few weeks of getting onto the list, Southern Health Monash Health contacted me and said they could do it at Cranbourne, sometime on the 10th of September — the precise time TBA. This was not just surprising, but also amusing, because I’d made an appointment on the same day (at 4:30pm) to get it done privately, at the rooms in Dandenong of the surgeon who had seen me at Monash Medical Centre in Moorabbin (East Bentleigh). I ummed and ahhed and eventually cancelled the public appointment, on the basis that it was worth paying the $150 to be able to know a definite time, to not have to potentially wait for long periods, for the possibly nicer service and environs, and to not have to travel as far. Plus, although I have a philosophical objection to private health insurance, I have the income that I can afford an occasional burst of money to get something like this done, and save a space on the public queue for someone who can’t. So anyway, similar to last time, they took a look, shaved some hair off, and gave me a local anaesthetic. I asked if this would render my leg unusable — a question I almost immediately felt foolish for. No — it really is a local anaesthetic, so only the surface near the lump is affected. The rest of the leg is fine. Then they drew lines on my skin, and sliced me open. I didn’t watch, but from what I can gather, the surgeon simply made an incision, then basically squeezed out the lump. It came out in bits, and he proclaimed it harmless — if I heard him right, it was calciosis aka calcinosis, specifically dystrophic calcinosis — a build-up of calcium in soft tissue, often caused by previous damage, such as injury. He asked me, and I couldn’t recall any injury in my right leg. I couldn’t. Any football injuries? Unlikely! I did fall off my bike as a teenager once, but I don’t recall if I fell on that part of my leg. Oh well. Anyway, the bits will be sent off to pathology for analysis. The nurse joked that some people like to take photos of what comes out, and so I decided to too. But I’ll spare showing you that here. It ain’t pretty. I’m sure (more than usual) people were staring at me on the train today. And you should see the amount of gunk that was in it this morning. 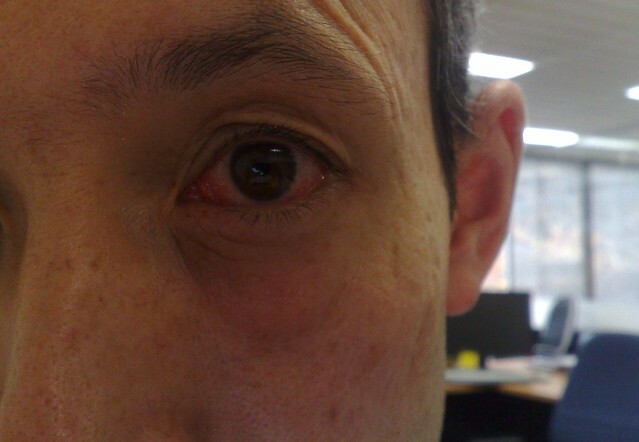 The doctor’s given me some eyedrops for it. For many years I’ve used Herbal Essences shampoo. While I hated the ads, I liked the shampoo. But recently I’ve noticed tell-tale white residue on my clothes. Oh no. Dandruff. Not nice. So I’ve switched to anti-dandruff shampoo for a while. It doesn’t smell as nice, but it appears to be working.